Outside of Tassie, if there is one cool climate wine region in Australia that shows the most latent promise it is the Macedon Ranges. I had dinner with a few Macedon winemakers a month or so back and there is a palpable sense of a region on the brink of greatness – like Canberra 10 years ago. The biggest challenge for Macedon, however, is scale. Many properties are ‘micro-boutique’ level in size, with wine often just a part of the business. That is not a problem in itself, but a lack of volume (and low yields) means less Macedon wines on lists. Stir in a local council that seems unhelpful (and downright obstructive in some instances) and a surprising lack of wine tourism, and it makes sense that it is still a fringe region. Still, the true cool climate of this GI is almost unmatched on the mainland. In particular, I can see a future beyond Pinot and Chardonnay and into aromatic whites, with real acidity on tap. There is a whole smorgasbord of interesting wines being made too. Like Lagrein (Cobaw Ridge doing it Südtirol style), Gamay (Lyons Will’s lovely light red) and Nebbiolo (Mount Towrong’s Valtellina-esque red). Curly Flat, as one of the largest producers in the region, carry the mantle in many ways. The talisman, with a national reputation. Jeni Kolkka is planting more vines as well, so Curly will only become more important. Lucky that the wines are in a good place! 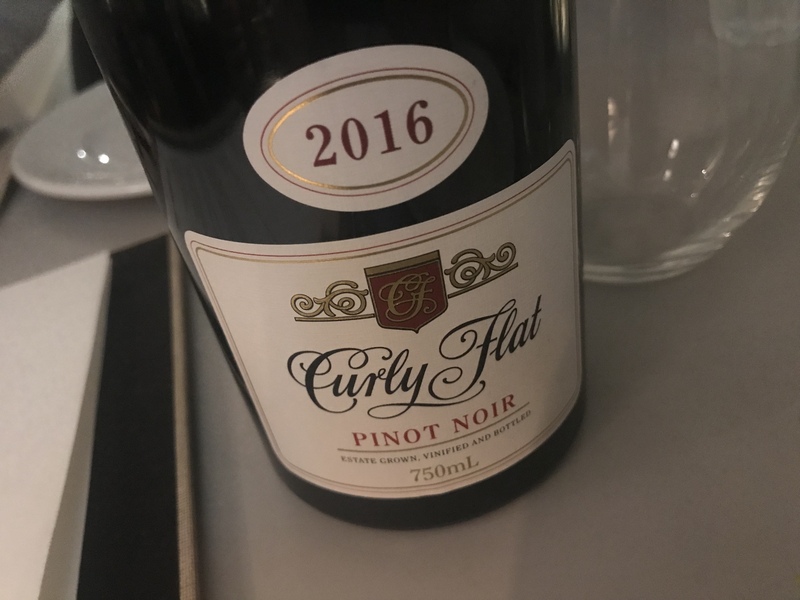 This ’16 Curly Flat is a lovely, generous example of Macedon Pinot Noir too. There’s tomato juice and sarsaparilla cool clime Pinot spice, but with plusher oak and juicier raspberry flavour. That combination, and the late bitterness, makes this a really enjoyable drink – there’s a real sense of fullness, the warm year filling out the palate. A bigger wine in context, but not to the point of excess. Nice wine. Best drinking: Good now, but perhaps even better next year. 13.7%, $52. 18.5/20, 94/100. Would I buy it? I’d drink this and buy it.